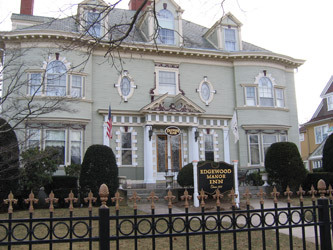 Edgewood Manor, with its historic Greek Revival Mansion, is the perfect backdrop for a Rhode Island wedding. Every room of our luxurious bed and breakfast exudes romance and can host a variety of weddings and receptions. 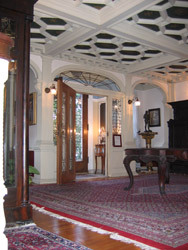 You may want an intimate ceremony surrounded by the antiques, fine art, and stained glass of the main house. Perhaps you have dreamed of sharing the big day with a reception for family and friends. Edgewood Manor seating capacity during the winter months is 60 people and in the summer time up to 150, which includes outside and inside seating. We also provide meeting space for rehearsal dinners, showers, parties, fundraisers, special high tea's and corporate functions. 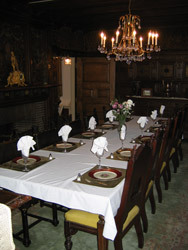 ~ Use of the entire 1st floor for bride and groom alone, or small bridal parties up to 60 people. Call (401) 781-0099 for pricing. After the festivities, choose one of our lavishly decorated rooms with a fireplace and whirlpool tub in Edgewood Manor or Newhall House for a romantic honeymoon. Have breakfast in one of the two dining rooms or the patio. Should you decide to take in the local sights, our Providence location is rich in history for you to explore. It isn’t Venice, but you can take a gondola ride on the Providence River. A complimentary basket of cheese and crackers and an ice bucket and glasses are provided. Let us suggest restaurants for dinner in Providence or Newport, among the finest in New England.